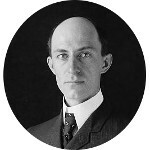 Wilbur Wright and his brother Orville were two American inventors and aviation pioneers who have been credited with inventing the airplane. However this claim has been challenged by competing early aviators and the title of being first is still subject to much controversy. The Wright brothers developed their mechanical expertise by working with bicycles, printing presses, and motors in their shop in Dayton, Ohio. They made history on December 17, 1903, when Orville Wright made what was then credited as the first controlled and powered heavier-than-air flight at Kitty Hawk, North Carolina. Wilbur and Orville Wright are descendants of Mayflower passenger Richard Warren. They also have kinship with no fewer than nine U.S. Presidents, including both Abraham Lincoln and Ulysses S. Grant. They have a connection to the current royal family through Princess Diana and have family connections to a number of individuals who had prominent roles in major events leading to American independence. Among their more infamous kin is the legendary Lizzie Borden, accused of murdering her parents, and John Hinckley Jr. who shot President Ronald Reagan in an assassination attempt.